© Scalzo/Epa-Efe/Rex/Shutterstock/Scalzo/Epa-Efe/Rex/Shutterstock President Trump speaks to reporters Wednesday before departing for a fundraiser in Dallas. President Trump on Wednesday revived the controversy over his handling of a condolence call with an Army soldier’s widow, refuting Myeshia Johnson’s claim that he did not seem to remember her husband’s name and calling into question the memories of others who heard the conversation. Trump also said he had not specifically authorized the mission in Niger, which left four U.S. soldiers including Johnson dead and has prompted a slew of unanswered questions about how the mission went awry. After Trump first called Myeshia Johnson more than a week ago to express sympathy for her husband’s death, the president has waged a back-and-forth war of words with the pregnant widow and others who listened in on the call. Rep. Frederica S. Wilson (D-Fla.), a family friend of the Johnsons, had criticized the president for insensitivity, saying he had upset Johnson by saying her husband “knew what he was getting into,” and seeming to bungle his name. On Wednesday, Trump again pushed back on the claim about La David Johnson’s name, repeating it to reporters and saying he had stated it correctly during his initial call — in part because he was provided with a chart that had the fallen soldier’s name written out. The firestorm has dragged in not only Trump, Wilson, and Johnson, but also the president’s Chief of Staff John F. Kelly, who made a surprise appearance at the White House news briefing last Thursday to defend Trump and attack Wilson for allegedly politicizing a Gold Star family’s heartache. But in doing so, Kelly made false claims about Wilson that were later disproved by videotape. 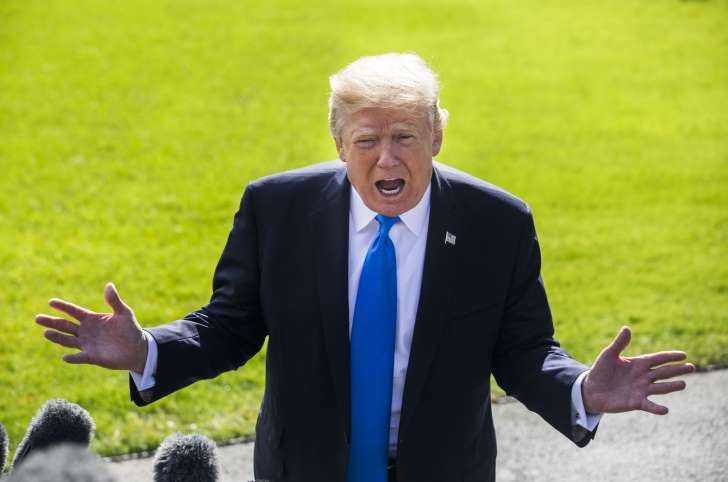 Trump struck a more deferential tone in his latest comments than he had in some earlier statements, largely praising Johnson and calling her “a lovely lady” while also defending himself. As for not authorizing the Niger mission, Trump’s remarks were reminiscent to comments he made earlier this year following the death of Senior Chief Petty Officer William “Ryan” Owens, a U.S. Navy SEAL who was the first U.S. service member under killed in the line of duty during Trump’s term. Trump’s impromptu, 15-minute news conference Wednesday came as he was fending off attacks from members of his own party — namely Sens. Bob Corker (R-Tenn.) and Jeff Flake (R-Az. ), who announced Tuesday he was not seeking reelection and delivered a scathing floor speech excoriating Trump. In response to a question about whether he should behave more civilly, the president, in rapid succession, blamed the media and cited his Ivy League education. In the next breath, however, he returned to his attacks. “Well I think it’s always okay, when somebody says something about you that is false, I think it’s always okay to counterpunch or to fight back,” Trump said. Why Did I Get Married…? The Africans Perspective….